The defining element of the modern celebration of Śmigus-Dyngus is . . . the Super Soaker. Although the holiday is probably pre-Christian – so over 1000 years old – it has remained strong in Poland. In the 1400s, Catholic authorities tried to ban the practice, but with no luck. Evidently, it’s celebrated in Czech Republic, Slovakia and Hungary as well. In Poland, Easter Sunday and Monday are holidays, with no school from Maundy Thursday through the Tuesday after Easter. Lent and the Holy Week are still important cultural icons in Catholic Poland, so from Carnival – just before Lent – through Easter Sunday, devout Poles don’t have much fun. They make up for it on Easter Monday, in a nation-wide water-soaking free-for-all. Of course, this is a bit of an exaggeration, as a lot of smart people simply stay inside! Young people though, especially kids, really enjoy this holiday! Śmigus-Dyngus actually combines two very old customs. Śmigus involved hitting one another with willow switches, and soaking one another with water. This evolved into using the “palms” left over from Palm Sunday, but the water soaking remained. 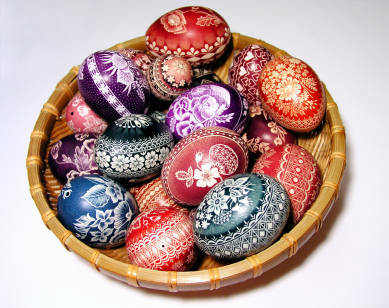 Dyngus referred to yielding painted Easter eggs, in order to avoid getting switched or soaked more, in a kind of ancient “trick or treat” ritual. I’ve never seen willow switches being used, although that custom might remain in rural Poland. Thankfully, because I think that would hurt! Nor have I experienced the “dyngus” portion, with the chance to buy relief from a soaking. Over time, the soaking practice has changed, as well. At one time, the men would soak the girls on Easter Monday, and the girls couldn’t carry out their revenge until Tuesday. My friends tell me that men would use this custom to show their interest in a particular young woman – a kind of “mating ritual.” Later, the women began soaking the men first – with the same intentions :). Of course, the practice always had fertility overtones – and you can probably imagine the possible outcomes of soaking one another with water – one of the reasons the Church tried to outlaw the practice. Of course, if you didn’t get drenched – that was worse than getting soaked, because it meant no one was interested in you! This year, we have nearly a foot of snow on the ground, and the temps are below freezing. Pretty sure no one will be soaking anyone outside, although I could see some snowball fights happening. Personally, I don’t intend to find out. Like most years – I’m staying inside.